As we head into another election season, there’s no doubt that we’re going to hear more over-the-top claims by the left about the supposed evils of voter ID. While those attacks rely on deeply flawed extrapolations and conjecture, hard data points us to a real concern. The left will remind us about a much-hyped 2017 study by UW-Madison political scientist Ken Mayer, bankrolled by liberal Dane County Clerk Scott McDonell, that claimed nearly 17,000 people didn’t vote in the 2016 general election because of Wisconsin’s voter ID law. Mayer’s analysis, released last September, asserted that at least 16,800 voting-age residents in Dane and Milwaukee counties may have been disenfranchised because of the state’s voter ID law. 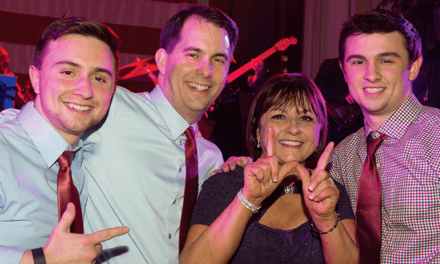 The deeply flawed study was faithfully bought into by the mainstream media in Wisconsin and beyond, ever sympathetic to cries from the left about so-called voter disenfranchisement. The media bought a lemon. 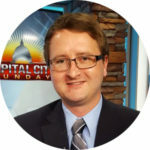 Out of 2,400 surveys sent to residents registered to vote in the two counties but who were identified as having failed to vote the previous November, Mayer only received 293 responses. 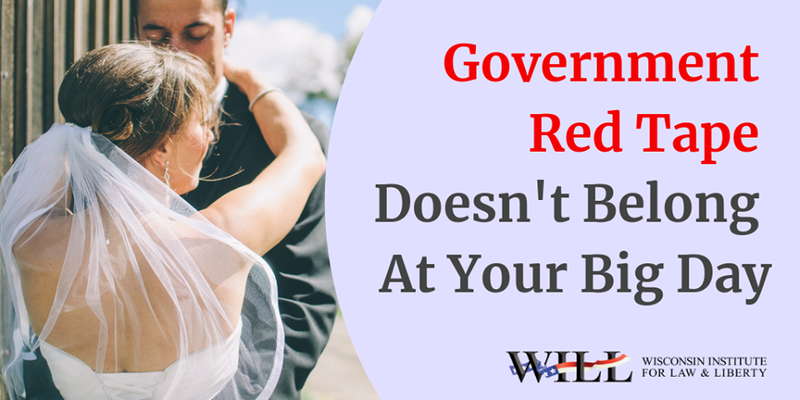 That’s a response rate of just 12 percent. It’s also less than 0.01 percent of the total number of votes actually cast in the 2016 election. Among those 293, a grand total of nine people claimed voter ID exclusively kept them from voting — just 3 percent of respondents. Only 1.7 percent believed they didn’t have proper ID, and 1.4 percent claimed they were turned away at a polling place. 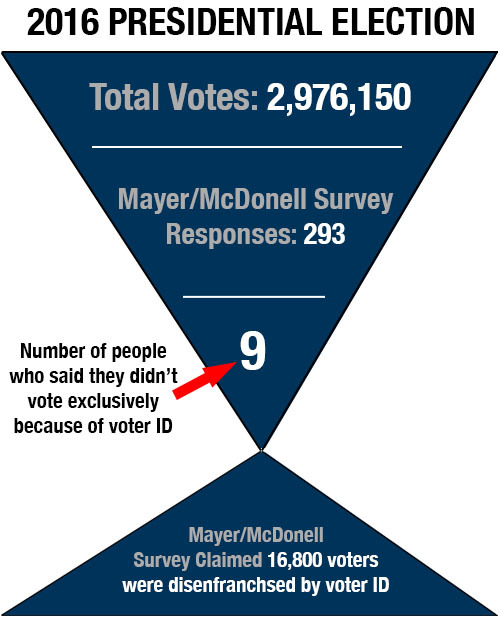 Using mathematical gymnastics, Mayer extrapolated that those nine people translated into 16,800 voters in Dane and Milwaukee counties who were deterred from voting by the state’s voter ID requirement. turns out factors other than voter ID played a much larger role in peoples’ decision not to vote. 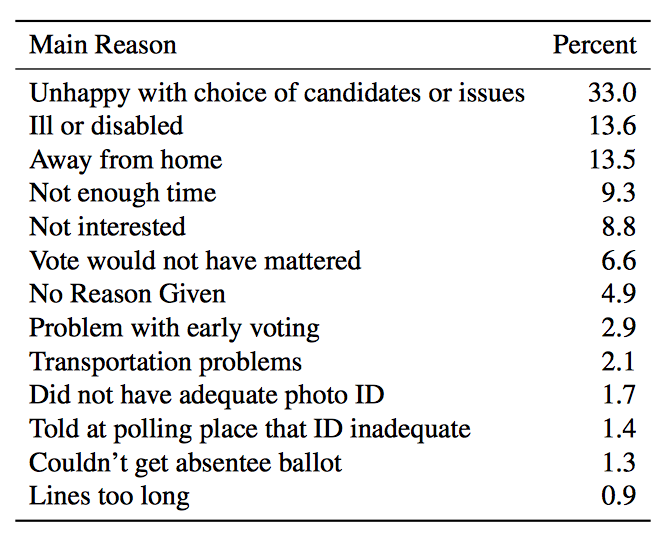 In fact, the UW study itself found that the vast majority of people who didn’t vote cited factors other than the minimal requirement of voter ID as the reason they stayed home. Some said they were sick on Election Day. Others felt discouraged by politics and politicians in general. And more didn’t like the candidates on the ballot. Turns out, the choice of candidates on the ballot was the biggest reason people weren’t turning out in Madison and Milwaukee, a factor cited by 33 percent of the survey’s respondents. If you’re truly worried about voter disenfranchisement and turnout, you should be more concerned about putting up a likable and inspirational candidate than voter ID. And even the study’s author admitted the poll’s total sample size of 293 respondents was problematic. “In polling terms, that’s a small number,” Mayer told MacIver News Service. 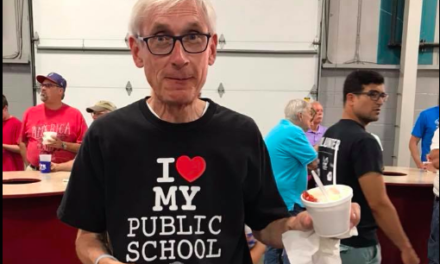 While he defended the 16,800 figure, he also said that had the study involved all Wisconsin nonvoters, instead of just those in Dane and Milwaukee counties, the number of responses would have significantly driven up the margin of error. Another attack on Wisconsin’s voter ID law we’re sure to be reminded of came from U.S. District Judge Lynn Adelman. When the liberal judge struck down the law in 2014, he claimed that 300,000 registered voters in Wisconsin lacked the type of identification required to vote. The clear implication was that hundreds of thousands of people were denied the franchise because of voter ID. The falsehood took on a life of its own following the 2016 election, when a tweet by a liberal angry over Clinton’s defeat went viral. “Trump won Wisconsin by 27,000 votes…300,000 voters were turned away by the state’s strict Voter ID law. There is your ‘rigged’ election,” tweeted blogger Dan Arel. Problem was, it wasn’t true. “I am willing to take some embarrassment for a mistaken tweet if the end result is a massive discussion on the legality and ethics of voter ID laws,” Arel later admitted. The claim that voter ID disenfranchised 300,000 people went on to earn a “False” rating from the Milwaukee Journal Sentinel’s left-leaning PolitiFact. “There is no evidence that 300,000 people were turned away in the November 2016 election,” political scientist Barry Burden told the publication. To partisan politicos on the far left, it’s a shame when facts get in the way of a good scare tactic. 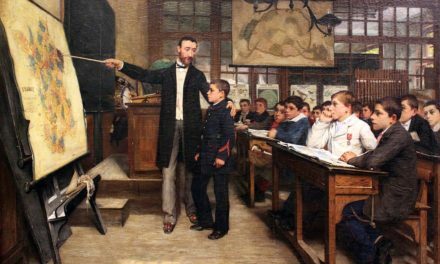 It’s curious that the left leans on dubious math and outrageous claims when there is plenty of hard data publicly available to worry about. Perhaps that’s because the data paints a different picture than the one they prefer. Elections Commission data reported by the MacIver Institute raises serious, real-world questions about the integrity of same-day voter registrations. The way many Wisconsin localities, particularly Milwaukee and Madison, handled a mountain of same-day voter registration irregularities is a legitimate concern. As first reported by MacIver, out of 368,392 verification postcards mailed to people statewide who registered to vote on election day in November 2016, 10,461 came back as undeliverable. While no one would claim all of those are cases of voter fraud, it’s concerning that so many people voted from addresses that were wrong or that they moved from just weeks later. 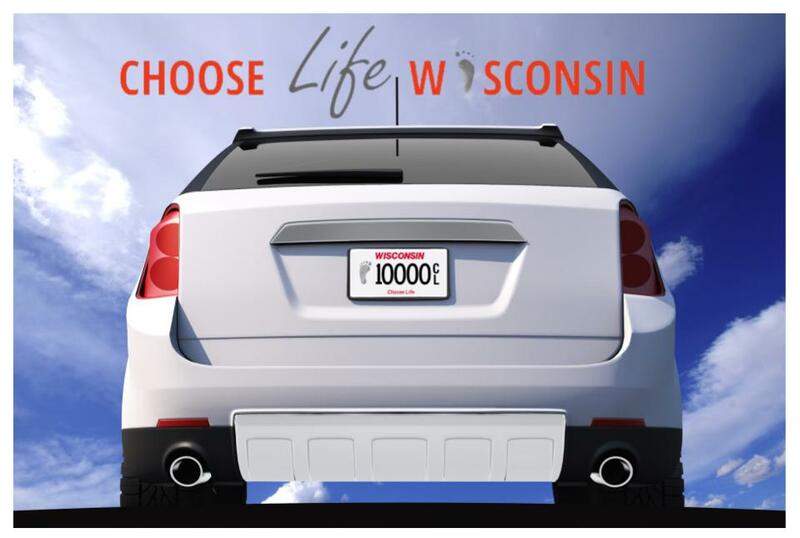 In the city of Milwaukee there were 44,797 same-day registrations, and 2,563 postcards bounced back. That’s nearly 6 percent of all same-day registrants’ addresses that were wrong when the person cast their ballot. In Madison, 20,491 people registered to vote on election day 2016 and 842 postcards bounced back, or just over 4 percent. Set against the 3 percent (nine people) of Mayer’s respondents who said they thought they didn’t have proper ID or were turn away from a polling place, election day registration irregularities are clearly a larger concern. Another concern is over how the irregularities are handled. Milwaukee and Madison have seemingly polar opposite approaches to this, both of which raise still more questions. 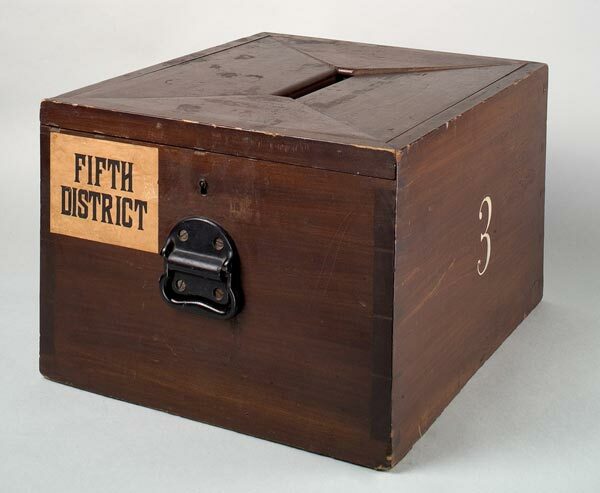 According to state law, for all election day registration postcards that are returned undeliverable and cannot be corrected, the voter registration record must be deactivated and the case must be referred to the district attorney. Milwaukee elections officials follow the law. For the 918 undeliverable postcards that they couldn’t reconcile against other government documents or by contacting the voter, they deactivated all the registrations and referred all the cases to Milwaukee County DA John Chisholm. They did the same after the 2018 spring general election. 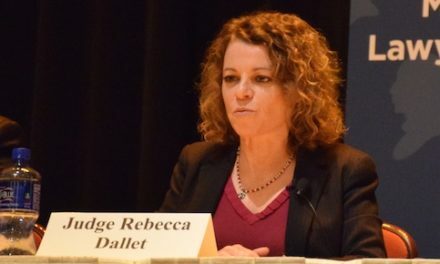 But MacIver News Service’s calls to the DA’s office asking how many cases were actually opened in response to the avalanche of referrals in 2016 went unanswered. That leaves a big open question: did Chisholm’s office open even one investigation, or did they let all the potential cases of voter fraud slide? 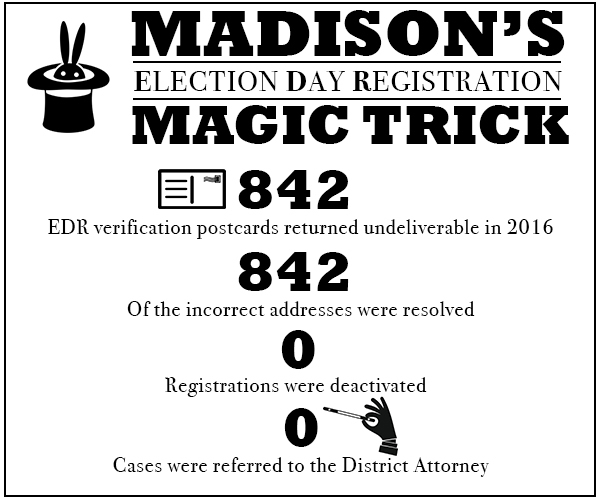 Madison, on the other hand, seemed to perform a magic act — elections officials there resolved all 842 problems without referring a single case to the DA, and without the modest step of deactivating even a single suspect voter registration. The same was true following the spring 2018 election. Out of 4,968 same-day registrations, 110 postcards bounced back and zero registrations were deactivated. The good news is that the problems with same-day registration declined compared with 2016. 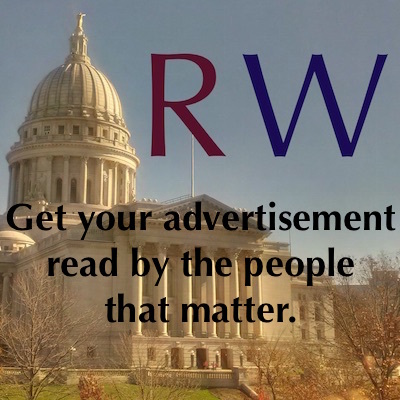 Asked what their policy is for handling same-day registration irregularities, Madison city officials directed MacIver News to the state Elections Commission’s guidelines and state law. 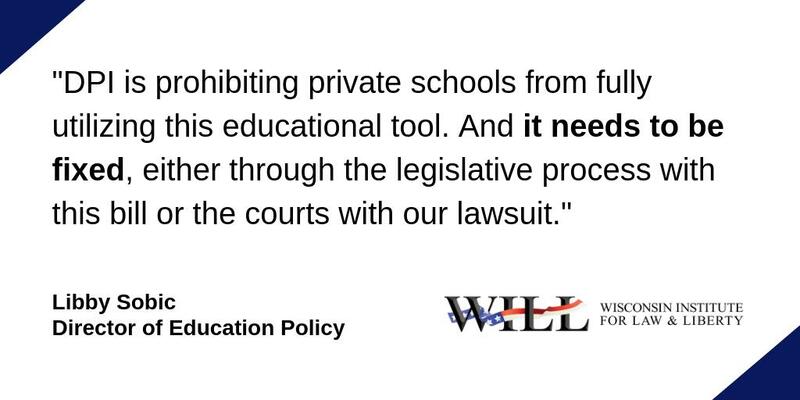 Since they somehow resolved every problem without deactivation or DA referrals – an improbable feat – technically they’re in compliance with state law. The questions swirling around these thousands of suspect voter registrations in Milwaukee and Madison turns the tables on over-the-top claims by election integrity opponents who despise voter ID. The hard data shows that it’s not voter ID that the voting public should be concerned about. They should be much more concerned about the surprisingly casual approach to managing the state’s voter registration rolls that puts the critical concept of one person, one vote in jeopardy.